Sharon Cleveland is a Certified Professional Photographer in Fort Worth Texas. Specializing in maternity, newborn, and babies through their first year. We serve the greater Fort Worth, Texas area. We provide a comfortable and professional photography studio for maternity, newborns and babies. We provide on location natural light sessions as well. Each session includes a pre-session consultation, over the phone, via e-mail, or in person (by request only). At this time we will go over details about your family and your session. Shortly after your session we will be in touch to schedule your viewing session. At this time you and your loved ones will preview your images at your viewing/ordering appointment. Includes up to a 3-hour session with Sharon Cleveland, a Certified Professional Photographer, with over 700 newborns photographed. We have a professional climate controlled Studio that will ensure your baby stays warm and safe. Sharon always works with a trained assistant to ensure baby’s safety. *We book newborn sessions by your due date. After delivery your session will be scheduled for when baby is 5-14 days old. We accept 2 newborn due dates each week. *Prints and/or digital images are sold separately. Prints start at $25 for a 4×6. For more pricing information, contact us. Book your session here by using your due date!Book Your Due Date Here! Good for baby’s first few years of milestones, (not for newborns). Includes up to a 30 minute session in studio, includes props and two set ups. Prints and/or digital products are sold separately. *Prints and/or digital images are sold separately. Prints start at $25 for a 4×6. For more pricing information, contact us. Includes up to a 1 hour Maternity session and up to a 3 hour Newborn Session in our studio. BONUS! Choose from 24 custom designed birth announcements or $100 print credit. Prints and products will be available for purchase after each session. *Prints and/or digital images are sold separately. Prints start at $25 for a 4×6. For more pricing information, contact us. Includes the studio cake smash and portraits before the cake smash in another outfit if desired. We provide the cake and decorations. *Prints and/or digital images are sold separately. Want family portraits? Add an outdoor family style session for $99. Prints start at $25 for a 4×6. For more pricing information, contact us. You may secure your session with a deposit below. If you have not scheduled your session date and time and would like to pay the deposit first you may do so and we will contact you to arrange it within one business day. If you are using a discount code please contact us at (817) 381-2020 or sharon@sharoncleveland.net, so we can invoice you with that discount. Have a blessed day! I’m shopping around for a photographer for my daughters senior pictures. 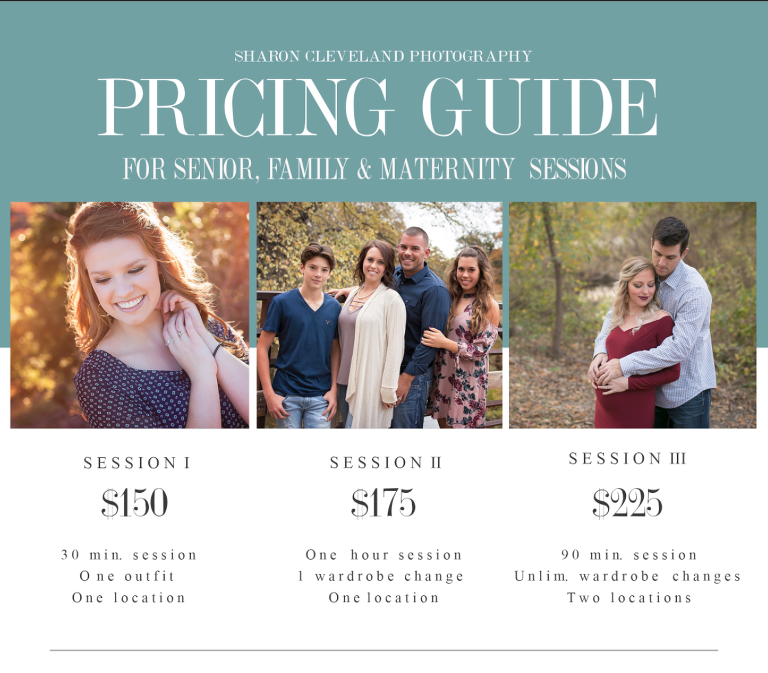 Do your sessions require a print purchase? How soon after our session are the pictures ready? Hi I am interested in new family pictures- 4month, 6 year old and 9 year old. I’d like pictures of baby, kids and some shots of the entire family. I’m interested in knowing if there are printing rights available also? If so, what is pricing for that? My due date is June 13. I have a few headbands I’d like incorporated into the photo session as well as baby with her dad, his fire gear, her with helmets from dad, grand dad and great grand dad around her. Of course a few with me and her and then her with both parents. I’d like a selection of her head propped into her hands as well as the most advanced photo skill. Please let me know if this is an option. Hi Sharon! I am looking for a photographer for my maternity and newborn pictures. I am interested in the belly to baby bundle can I get more info on pricing? You pictures are beautiful!! I’m interested in the newborn session. My due date is September 7. I wanted to check and see more of what your pricing was for digital files! Thank you!! We are interested in some family pics and we are located in Saginaw. Some natural light photos would be nice. What would the price be and the cost of prints. Hi Sharon! I was curious as to the pricing for digital images or if there is a price for a disk of digital images and how many images would be included in that. I am due January 8 and love your newborn pictures! What would it entail to book a session. And are all your sessions done in studio with wraps and props provided or will we need to provide our own? Hi! I will be expecting my baby boy soon and am looking to book a photographer. I have a few questions regarding your newborn photo session? Please email at yout request convenience. Thank you! I am currently searching for a photographer in the Saginaw,TX area, and I wanted to get your pricing on Maternity photos and possibly newborn photos. I’ve notice on your website that you have a bundle going on “Belly to Baby Bundle” for $300, is that still accurate?? Just to get an understanding its a Maternity session and once the baby arrives, I can come back for the Newborn portraits all for the same price?